Social media marketing is an absolute must to establish your education brand’s authority and authenticity. Here are some helpful tips to ramp up your higher education social media strategy. 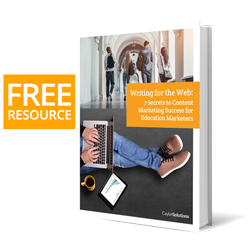 Content curation for education and enrollment marketing is a must-have in your content marketing strategy. But what kinds of content should you curate? Enrollment marketers face some big challenges. Here’s how a high-touch enrollment marketing strategy can level the playing field. Have you heard of being audience-centric? If not, it’s time to talk about audience-centric enrollment marketing so you know how much of this growing philosophy to integrate into your marketing. Each generational shift sends massive shockwaves through the world of education marketing. Generation Z is already making its mark in education marketing. Is your marketing reaching them effectively? Should you organize your independent school website by department or by audience? Here’s my navigation formula for making your website simple for your visitors to use. Your school’s marketing team will look a little different from other institutes, but there are key positions that every education marketing team must have to be successful. It’s a new year, a new semester, and a new chance to improve your education marketing! But you can’t do that without the right people on your marketing team. You Mean Video Marketing Doesn’t Have to Break the Budget? We all know that high quality produced video can be quite expensive, but there are also a lot of affordable ways to use video marketing. While having demographic details can certainly help focus your admissions marketing efforts, there are general principles that can be applied that will help move these undefined prospects from “speed dating” in general to considering a “date” with your institution specifically. Merry Christmas and Happy New Year from Caylor Solutions! I know you’re working hard before the end of the semester, but don’t get left out this holiday season! Here’s a list of must-have resources for your enrollment marketing gift list. Colleges, universities and private K12 schools typically use a viewbook as the main printed marketing piece. In this video, I highlight a viewbook I received from Olivet Nazarene University – it’s the perfect example of what should be done to attract Generation Z. Failing to plan is planning to fail. But where do you even begin with your education marketing plan? Tackle the blank sheet in front of you with this quick guide.